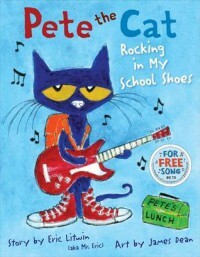 This precious book is one of an adorable series: Pete the Cat! This particular book is about Pete's first day of school as he discovers new places like the lunchroom, library, etc. The Lexile level is AD600L. I would use this in a kindergarten or 1st grade classroom. I would read the book first and there's even a song that goes with it, so we would sing that. I would then give each child a picture of the cafeteria, school bus, classroom, library, school, and playground and have them retell the story by putting the events in order. We could then take a walking tour of the school and as we stop by each place that Pete went, ask the students "Are you worried?" and have them say "Goodness NO!"